- Track code commits by associating them with bugs or tasks. This will help you identifying which files are added, updated or deleted against a particular bug or task. - Mark your task or bug resolved just by following a simple convention when writing your comments for commit. 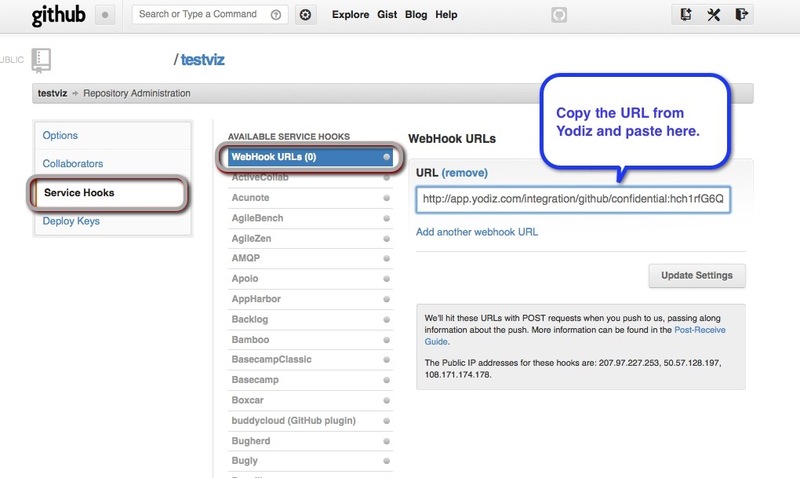 Paste here the Yodiz URL that you copied at step 1 and press "Update Settings"
In your commit message, add following notations to link commits to Tasks and Issues at Yodiz. The commit message will be included in Task with ID 25. "R" will indicate that this task is completed and Yodiz system will update the task status automatically. The commit message will be included in Issue with ID 12.